I do not like moral dilemma’s. I don’t want to have to argue with myself whether telling or not telling is a good thing. Or alternatively, whether telling or not telling is a bad thing. I am sitting here knowing a friend of mine is hurting herself with her choices. She is making them from an adult, grown up perspective and so I should sit back and allow her to do so. But her choices are hurting her. They are hurting her physiologically and psychologically and it breaks my heart to see her hurting so. But, if I tell her that I know she is doing this she may just pull out of our friendship. That would mean not being there when she really needs someone. I also don’t want her to hide the issues surrounding her, as in the end that would be worse. So, I feel I am left with no choice but to let her carry on making decisions which are harming her. I will have to hope someone else will confront her and tell her. Maybe that is being a bit cowardly, but I really don’t know what other choice to make right now! At least for dinner, this choice was easy. 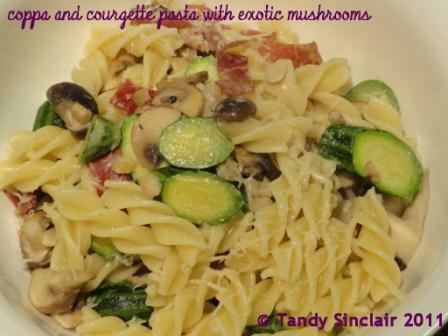 I looked in my fridge, found some coppa, courgettes and mushrooms and made a simple pasta. Agreat recipe for Meatless Mondays! only if you leave out the coppa! Very tricky – maybe your pal will ask for your advice and then you can give it? Good luck. No luck needed though with the pasta….looks great! Sometimes being a good friend means risking the friendship, but I really don’t envy your situation. This pasta looks wonderful, my husband made something similar recently. There’s just something about zucchini and pasta, throw in mushrooms, even better! I love mushrooms too! I followed your black truffles in cream sauce recipe, it was good. Will blog about it later. This is really a tuff one…just wanted to know…how do you create a challenge, I am thinking something like – each blogger say what they have in the fridge and someone comes up with what they think you can make with it either from experience, or from a book or from someone else blog, or something that they have tried 😉 When is your challenge for in season vegetables end? that challenge sounds great! Just blog it and see who takes part 🙂 The regional and seasonal challenge ends on the last day of the month! Great recipe, love pastas in any form, maybe a big bowl of pasta shared and a casual chat with your friend would do wonders, otherwise just listen. There’s not much worse when you have no control over something you think or know may not be the right thing for a friend, but you have to just sit and hope it turns out for the best. If it doesn’t..hopefully it’s a lesson learned for her. If it does, then you breathe a sight of relief. Been there. That said, I know one decision that’s a good one in any frame of life. Making this awesome pasta dish! Once my appetite is back – it’s on my list! L’Shana Tova to you and yours too!